Enveloped, lemon-shaped, flexible with short tail-like fibers attached to one pole that extend through the envelope. Linear dsDNA genome of 14,5 kb, encoding for 35 ORF and with inverted repeat sequences (ITRs) at its termini. 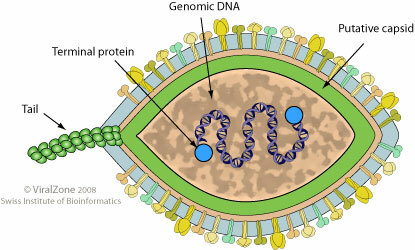 The genome also probably possess terminal-bound proteins, which may be used as replication primers. Genome replication, presumably by the viral DNA polymerase, which would use the terminal proteins as primer for DNA replication.